Women are getting a raw deal. This news isn’t exactly revelatory; women have been getting a raw deal since the beginning of time, especially when it comes to employment. Despite equal pay legislation and decades of progress, we still earn only 81.8 percent of the typical male salary. Pay inequality isn’t the only hurdle: The challenge of earning a living becomes even more tenuous with kids in the mix, and the problem extends beyond comparing the stay-at-home mom vs. working mom. Our culture increasingly supports equal parenting, but mothers still put in more work than fathers, according to a 2018 report by the Pew Research Center. Taking on the role of Everyone’s Everything (i.e., Mom) requires flexibility, and the gig economy is perhaps the first employment structure that provides it. A recent study showed that women in general value flexibility above any other factor in their career search, including compensation, title, and location. For mothers, the ability to step away during work hours is often crucial, and there are several networks within the gig economy aimed at meeting those needs. Hiremymom.com, a paid job listing site, was built specifically for skilled employees with family obligations. The site allows you to browse the current gig postings, which can range from full-time positions to one-time assignments. Recent opportunities include calls for a writer, web developer, project manager, inside sales associate and executive assistant to a CEO. Full-time employment doesn’t provide the necessary work/life balance. The family prefers a stay-at-home parent. In the days before online employment and flex work, women’s choices were limited, but working from home has become increasingly accepted in the U.S. In fact, contractors and freelancers will account for 43 percent of the American workforce by 2020, according to an Intuit study. For mothers, this growing trend provides geographic freedom to pursue positions outside of their own zip codes. For example, suppose your family’s lifestyle is better suited for the suburbs, but your skills as a management consultant are sought after in urban areas. A quick search on Indeed.com revealed 80 senior level positions that support virtual office work, eliminating the need for you to choose between being a stay-at-home mom vs. a working mom. Women who leave the workforce to have children face a tough market when they return, and many of them will. An employment gap is difficult to overcome if you decide to return to full-time work, and freelancing can help you stay active in your field even if you aren’t ready to return to the office. For a writer, the gig economy often means pitching individual publications like magazines and newspapers or looking for one-off gigs with sites like FreelanceWritingGigs.com. The same approach applies to other professions, including designers, managers, finance experts and more. The wage discrepancy isn’t going away, but the gig economy levels the playing field a bit with its structure. 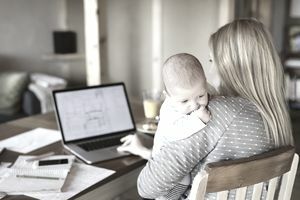 One-time jobs and remote work are beneficial for moms, but employers profit from the arrangement as well because it allows them to economize office space and avoid paying benefits to temporary workers. The result of these cost savings usually equals higher pay for freelancers, regardless of whether they have children running around the house. Mothers working in tech, for example, can earn more than $100 an hour using their skills in positions they find through Upwork and other temporary employment sites. Being a mom is a rewarding job, but that doesn’t mean you have to choose between parenting and a successful career. The gig economy employs people from every skill level and schedule type, and work has never been more accessible. Take advantage of the freedoms of flex employment and put the stay-at-home mom vs. working mom struggle to rest once and for all.